My life has been full of messages and signs that I will be sharing on my site in the weeks to come. I was always drawn to Japanese culture- I had my first kimono before I could walk, our beloved neighbor Debbie Cutler gave it to me. When I was 12 we had an exchange student from Japan live with us, I felt for a while that she didn’t really get the All- American experience since she was living in an Armenian household- I’m laughing as I write this. Dolmas and Lamajunes? ?- I’m sure we did more take out when she was with us- I wish I could remember. I slept on a tatami for a several years and loved it- I want to go back to that someday. I remember being blown away by going into our neighbor’s zen garden as a kid. I can’t get enough of vintage kimonos, love the tea, the food, the smells. Now, I live and work in a very Japanese part of town-The Sawtelle area and I love the landscaping- and the great markets, shops and restaurants -and none of this was planned- it just happened. In 2002, I was listening to The Aware Show and heard Takashi Tanemori, a hiroshima survivor, speaking about his story of “Revenge to Forgiveness”. Instinctively, I reached out to him by email and heard back from him almost immediately. He included his phone number and I called him. As I was talking to him I had a strong flashback/memory of knowing him, knowing his spirit- My memory was of feeling the blissful warmth of the sun as I felt his presence beside me- I was a silkworm hanging beside him in a cocoon, and so was he! I felt this was centuries ago, and yet that memory came to me like it was yesterday. I will never forget that feeling. It happened that I was going to be in Silicon Valley later that week and he lived about 40 minutes from there- so we met in person, and had tea in his Japanese garden, and he shared his art with me. We have been friends since then. Takashi’s message of peace through forgiveness has resonated with me so much. Read about Takashi’s story His story is proof that love has the power to transform. And as I’ve written before, perhaps my art of transforming clothing, and my own journey of forgiveness, both with lot’s of love , is also proof that love is the answer. And maybe the two silk worms hanging from a branch centuries ago have come back as humans to teach about transformation. 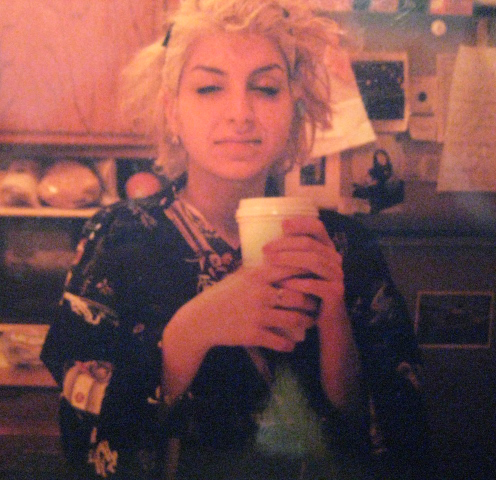 Here I am one morning clutching my Starbucks, 3 years before I met Takashi- in a kimono, going through a Marilyn phase.. perhaps another sign…: I lived at her exact Sherman Oaks address for 4 years and didn’t know it until I moved and now live a block from another place she used to live. And since I mentioned Debbie Cutler, the sweetest women I have ever known, I have to tell this story- One day, living in my first Sherman Oaks Apt- not the Marilyn Monroe one, but also another very special place on Dickens, I was thinking abut Debbie Cutler. I thought about how she had always been there for me, remembered all the holidays, my birthday every year and my brother’s, and always entertained me when she baby sat- I felt sad that I hadn’t been there for her, or even saw her when she died- I thought of her often, but that day it was really strong. So imagine how I felt when I got my mail, there was a letter addressed to Debbie Cutler in my mailbox! – It was to a totally different address- not even on the same street. I couldn’t explain how that happened, but I know that I felt her love, and her forgiveness of me not seeing her at the end of her life. I take my lessons from nature. I look at ants, and figure that they have no concept of what we as humans do, what movies are like, or what ipads are- and I figure that there are mysteries that we as humans have-that we have no concept of, but I do think the feelings we get, and our instincts are the clues into these mysteries.